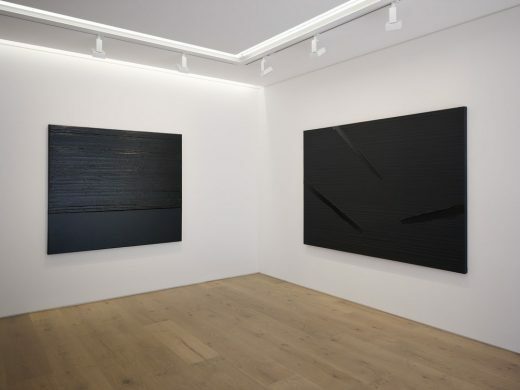 Following openings in Paris, Hong Kong, New York and Seoul, contemporary art gallery Perrotin, founded in 1989 by Emmanuel Perrotin, opened its newest gallery in Tokyo on June 7th with a solo exhibition bringing together a collection of recent paintings by 97 year old Pierre Soulages. 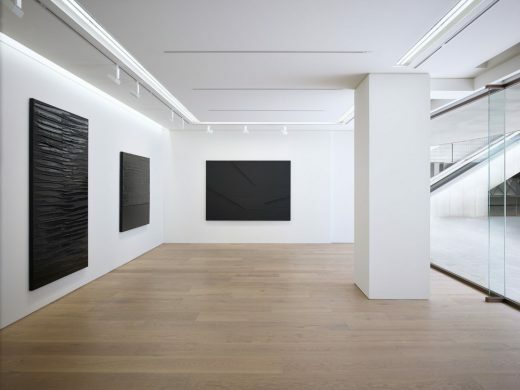 The interiors of Perrotin have been designed by the internationally renowned Hong Kong architect Andre Fu, who was also the designer for Perrotin’s Hong Kong space, which opened in 2012. 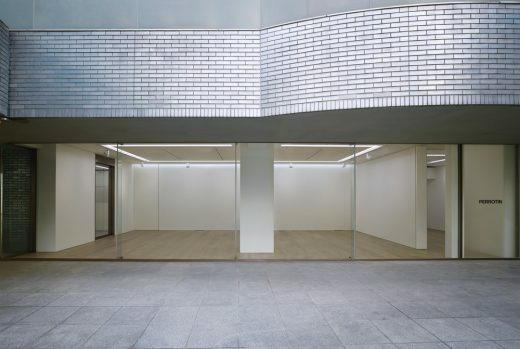 Nestled in the heart of Tokyo’s dynamic Roppongi neighbourhood, the gallery is located on the ground floor of the Piramide building and has been visualized by Fu and his design studio AFSO as a modernist art space that responds to the gallery’s distinct street-front location. 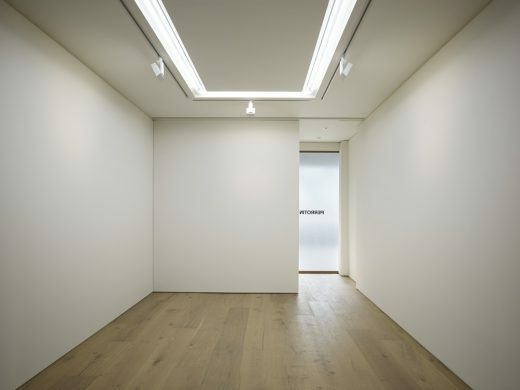 The 140 square foot gallery is pure, contemporary yet highly intimate. 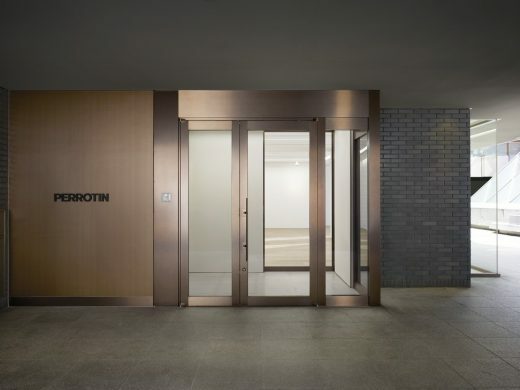 A key design challenge was the need to create an unconventional visual connection between the outdoor and the indoor – with vast floor-to-ceiling glass windows at the reception and the main exhibition space, the urban life of the Roppongi neigbourhood is heavily integrated into the daily life of Perrotin. Respect for the local Japanese culture which values privacy was an essential consideration for Fu to incorporate in his design and he has provided an elegant solution with an intimate foyer reception area serving as an intermediate space on arrival, providing a significant contrast in its proportions to the main exhibition room beyond. 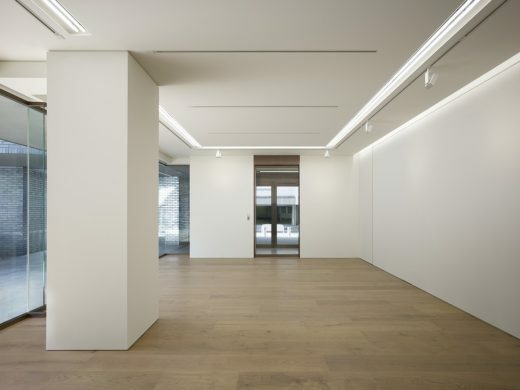 The main exhibition space is adorned with solid washed oak floorboards that evoke a sense of understated modernity. 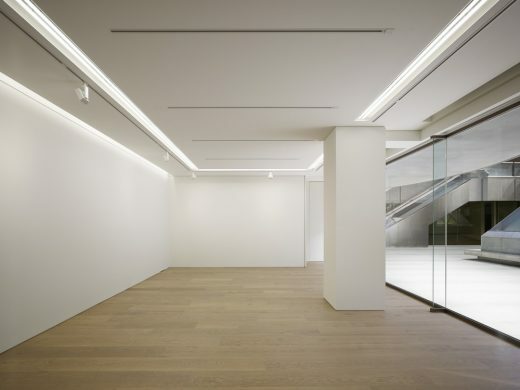 A matrix of meticulously considered lighting system has also been incorporated into the space to allow flexibility when lighting exhibitions. 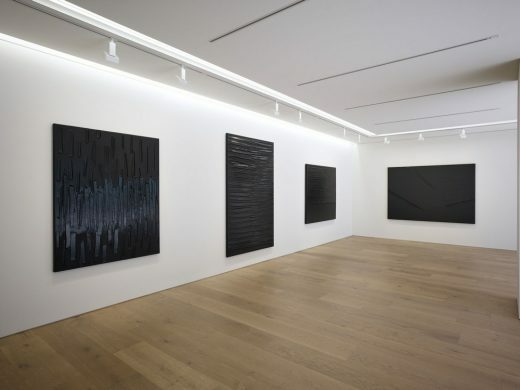 As well as the exhibition space that conveys a visual purity through his design, Fu has also introduced a Salon at the rear end of the gallery. The Salon allows more private discussions and a place for friends of the gallery to have a moment of quiet retreat from the city beyond. As the architect behind major luxury hotels like The Upper House in Hong Kong, Villa La Coste in Provence, Singapore’s Fullerton Bay Hotel, and the Opus Suite at the Berkeley London, André Fu has become one of the world’s most sought-after designers. Brought up in the East and educated in Europe, Fu founded his design studio AFSO in 2000 to create distinctive projects for select clients, and AFSO is now recognized for its work in sensuous, unique hospitality venues. With its head office in Hong Kong, the studio lists clients such as the Four Seasons Hotels & Resorts, Shangri-la Hotels, Swire Hotels, Capella Hotels, Park Hyatt Hotels and The Berkeley Hotel. Fu has also worked with fashion company Cos, luxury retailer Louis Vuitton, Lane Crawford and gallerist Emmanuel Perrotin. In 2016 he launched AFL, a lifestyle brand with a select retail platform offering products to a global audience that appreciate Fu’s curated world of relaxed luxury. AFSO’s distinctive approach to interior architecture combines the rigorous pursuit of new Asian sensitivities, with clarity in space planning and keen attention to details of everyday life. It has applied its vision of design to the fundamental qualities of space, proportion, light and lush materials. Its emotional spaces are created to inspire and indulge. Drawing from historical references, AFSO reinterprets traditional ideas using André Fu’s unique and playful interpretation. The studio is currently working on a number of projects, including Bangkok’s Waldorf Astoria Hotel and the Andaz in Singapore. Fu’s most recent project, The Kerry Hotel in Hong Kong, with interiors designed by AFSO, opened in April 2017.